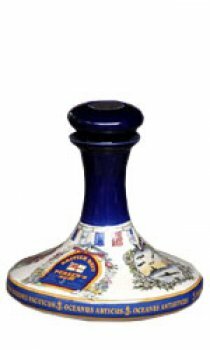 The "John Paul Jones" U.S. Navy & Marine Corps Ship's Decanter is named in honor of the U.S. Navy's first great hero- Captain John Paul Jones of the Bon Homme Richard. Jones was born in Scotland in 1747, and was taken to America at age 13 years. After sailing for several adventurous years on merchantmen in the American trade, he was appointed a first lieutenant in the new U.S. Navy on December 22, 1775. A year later as first lieutenant on board the Alfred, he hoisted by his own hand the first flag ever flown on a U.S. warship. It was a curious banner of yellow silk bearing the figure of a rattlesnake. In June, 1777, he was given command of the ship Ranger 18-guns, which was the first ship to fly the new national flag of stars and stripes. At Quiberon Bay, on February 14, 1778, he secured a salute to the new American flag by the commander of the French fleet. This salute was the first acknowledgement of American independence by a foreign power. Finally, in 1779, he was given command of a small squadron which he commanded from the 40-gun Bon Homme Richard. It was for an action on this ship that he is best remembered. On August 23rd, he encountered a fleet of forty-one sail of merchantmen under convoy of two British ships-of-war, the Serapis, 44-guns, and the Countess of Scarbrough, 28-guns. Jones at once prepared to give battle. It was nearly dusk when the two ships closed and began the fight. Shortly, the Bon Homme Richard began to suffer heavy battle damage. Only three of her nine-pounders or heavier were still firing; the ship was a shambles and in danger of sinking. The Bon Homme Richard and the Serapis came together, and the Serapis hailed to know if Jones had surrendered. "I have not yet begun to fight!" was his memorable answer. Most others would have surrendered as his officers urged, but defiantly, Jones continued the battle with the ships lashed together. Finally after a desperate fight, the Serapis struck her colors, and the legend of John Paul Jones was born. The United States Navy had its first great hero.